Lock in a great price for The Hume Inn Motel – rated 8.1 by recent guests! Front desk staff member very warm and down to earth. Room very clean. Perfect place to stop over for the night. A good location and price for our stay. Very clean and comfortable. The staff were very helpful and the breakfast was very enjoyable. Although being an older style motel it was very clean and comfortable would highly recommend staying there as we intend to return when next in the area. Staff were wonderful, we were checking out early so supplied all our breakfast needs the night before. Would definitely recommend this motel. The Hume Inn Motel has a lovely swimming pool area and garden with barbecue facilities. 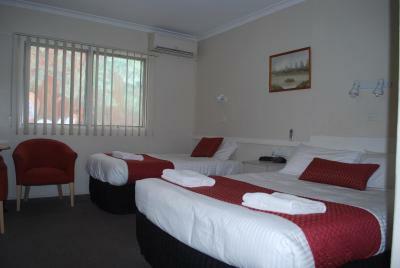 It is located just a few minutes' walk from the Albury city center. The Hume Inn overlooks 17 hectares of landscaped parkland and the Murray River. Nearby, you will find a shopping complex, restaurants and bars. Complimentary Continental breakfast is available every morning. All the rooms come with air conditioning, WiFi and tea and coffee making facilities. Bathtub is available in some rooms. 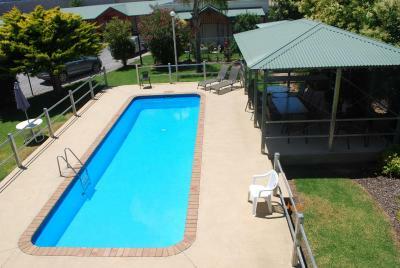 뀐 Located in the top-rated area in Albury, this property has an excellent location score of 8.6! When would you like to stay at The Hume Inn Motel? This air-conditioned room features a TV and tea and coffee making facilities. This single room has an electric kettle and air conditioning. House Rules The Hume Inn Motel takes special requests – add in the next step! All children under 2 years are charged AUD 12 per person per night in a crib. The Hume Inn Motel accepts these cards and reserves the right to temporarily hold an amount prior to arrival. Kettle, coffee, tea and sugar available but No teaspoons for making coffee, no extra pillows available, air conditioning poor. shower over bath--bath is narrow and difficult/dangerous for us (78 and 79 years old). Could be improved with a grab rail to provide support during entry and exit from bath. Breakfast very basic, pizza place on premises closed even though it’s been rated and recommended. Basic motel, no surprises, good for an overnight break when traveling. The bed was hard and the noise from the aircon/heater with the rain dripping on it was so loud and right near your head you couldnt sleep. And the fridge didn't work well. The breakfast had a variety of foods to eat and a selection of drinks. Room 30- referred to by others with a similar experience. Booked as a "Budget Queen" room. Not at all like the pics. I have pics but won't publish here: someone has tried to kick a hole through the wall; cosmetic damage to the (noisy) aircon unit (which was at floor level? ); the carpet, tiles and chairs were dirty; couple of small cockroaches joined me at night; ants in the bathroom; bedding airing on the pool fence (?? ); the on-site restaurant has ceased business so there were no evening dining options. The only food (that wasn't the usual chain hamburger joints or a prepack sandwich from the BP down the road) was in town ~750m walk away; no knives or forks in the room and just one teaspoon for coffee making; my monitor is bigger than the tv which is up on a stand, at an uncomfortable angle to watch. It needed a more effort and some money spent in maintenace. Staff were very friendly and helpful. The breakfast was a bonus. Fridge was not working on arrival.